Well I recently had the opportunity to visit the great city of Chicago! It had been many years but I had fond memories and the city did not disappoint! If you mention Chicago most people think of the delicious deep dish pizza (can you actually eat more than one slice? ), the wind, Oprah (didn’t her show put this city on the map?) and perhaps like the week I was there- the streets were in a frenzy over the Cubs (it was the playoff’s). But to us designers it’s like love at first sight………our focus instantly is taken aback by the amazing art, architecture and design! This city has some of the very best architecture, and what a variety! Where else can you view early warehouses, art deco, mid-century and post-modern all within minutes? The Chicago Architecture Foundation River Cruise is an amazing way to see the city’s best buildings! There is no better vantage point. If you have read any of my previous blogs you will recall that one of my all-time favorites is Mies Van der Rohe. His work is on display at the AMA Plaza which was his last building before his death (so simply modern and minimalist). Other highlights include Marina City by Bertrand Goldberg which was intended to be “a city within a city” and which locals refer to as the “corn cobs” due to its unusual shape (or if you ask my business partner- she will call it as the pancake building). And finally, one of Chicago’s most historic landmarks – the Lyric Opera’s Civic Opera House – which was built in 1929 and fully restored in 1996. The Civic Opera House is a hybrid of Art Nouveau and Art Deco designs and creates a majestic setting for entertaining on any scale. The 3,563 seat theater is the second-largest opera auditorium in North America. Here in Chicago public spaces are not just beautiful and well designed, but include over 200+ parks that participate in “Night Out”! Night Out is a multi-service app that provides up to date info on all the fun and free events happening in and around the city. The city offers everything from movie screenings, yoga, and dancing all the way to a Halloween parade! There is always an event at a park near you. Salsa dancing after work anyone? No one dare call Chicago “no fun city” – are you listening Vancouver? We need an app and events like this, don’t you think? These parks are absolutely beautiful! Millennium Park is home to the very talented Frank Gehry’s Pritzker Pavilion. I would love to go back next summer and attend a concert here! Did you think I would forget the bean? Never! It is so fun, whimsical and entertaining! Formally known as “Cloud Gate”, the bean is designed by artist Anish Kapoor and made of polished stainless steel. It is the pride and joy of this streetscape, filled with tourists taking selfies. 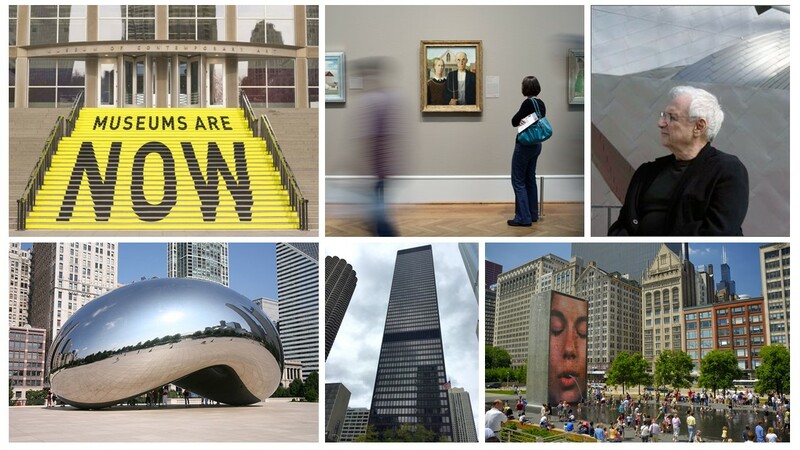 Besides the bean, you will find an evolving and revolving feast of outdoor art. Love this!!!! Some of the pieces were so new or temporary I couldn’t even find any info on them. The experience was delightful, I love that everyone gets an opportunity to be exposed to art. On this trip I didn’t have enough time to visit the amazing Art Institute or MCA, but am sure they would not disappoint (visited on my last trip)!